Not to be confused with the Chevrolet small-block engine. The LS based small-block engine is the primary V-8 used in General Motors' line of rear-wheel-drive cars and trucks. Introduced in January 1995, it is a "clean sheet" design with only rod bearings, lifters, and bore spacing in common with the longstanding Chevrolet small block V8 that preceded it as the basis for GM small-block V8s. The basic LS variations use cast iron blocks, while performance editions are all aluminium with cast iron cylinder liners. The LS small-block has been manufactured in three Generations – III, IV, and V – with preceding Generations I and II of modular GM small-block engines having been based on the Chevrolet small-block V8 originally designed in 1955. GM recycled the "LT" designation beginning with the LS Generation V "LT1" in 2014. The GM Generation I and Generation II (LT) engine families are both derived from the longstanding Chevrolet small block V8. The Generation III small-block V8 was a "clean sheet" design, which replaced the Gen I and Gen II engine families in 2003 and 1996 respectively. Like the previous two generations, the Buick and Oldsmobile small blocks, the gen III/IV can be found in many different brands. The engine blocks were cast in aluminium for car applications, and iron for most truck applications (notable exceptions include the Chevrolet TrailBlazer SS, Chevrolet SSR and a limited run of Chevrolet/GMC Extended Cab Standard Box Trucks). The architecture of the LS series makes for an extremely strong engine block with the aluminium engines being nearly as strong as the iron generation I and II engines. The LS engine also used coil-near-plug style ignition to replace the distributor setup of all previous small-block based engines. The traditional five-bolt pentagonal cylinder head pattern was replaced with a square four-bolt design (much like the 64-90 Oldsmobile V8 ), and the pistons are of the flat-topped variety (in the LS1, LS2, LS3, LS6, LS7, LQ9 and L33), while all other variants, including the new LS9 and LQ4 truck engine received a dished version of the GM hypereutectic piston. The cylinder firing order was changed to 1-8-7-2-6-5-4-3, so that the LS series now corresponds to the firing pattern of other modern V8 engines (for example the Ford Modular V8). The first of the Generation IIIs, the LS1 was the progenitor of the new architecture design that would transform the entire V8 line and influence the last of the Big Blocks. The Generation III 5.7 L shares little other than similar displacement, external dimensions, and rod bearings, with its predecessor (LT1). It is an all-aluminium 5,665 cc (5.7 L; 345.7 cu in) pushrod engine with a bore and a stroke of 99 mm × 92 mm (3.898 in × 3.622 in). When introduced in the 1997 Corvette the LS1 was rated at 345 hp (257 kW) at 5,600 rpm and 350 lb⋅ft (475 N⋅m) at 4,400 rpm. After improvements to the intake and exhaust manifolds in 2001 the rating improved to 350 hp (261 kW) and 365 lb⋅ft (495 N⋅m). The LS1 was used in the Corvette from 97-04. It was also used in 98-02 GM F-Body (Camaro & Trans Am) cars with a rating of over 305–325 bhp (227–242 kW), which was rumored to be conservative. The extra horsepower was claimed to come from the intake ram-air effect available in the SS and WS6 models. In Australia, continuous modifications were made to the LS1 engine throughout its lifetime, reaching 380 hp/365 ft-lb in the HSV's YII series, and a Callaway modified version named "C4B" was fitted to HSV GTS models producing 400 bhp (298 kW) and 405 lb⋅ft (549 N⋅m) of torque. The 4.8 L and the 5.3 L are smaller truck versions of the LS1 and were designed to replace the 305 and the 350 in trucks. Both the 4.8 L and the 5.3 L share the same engine block, heads (upper end) and as they share architecture, some parts interchange freely between these engines and other variants in the LS family. The Vortec 4800 LR4 (VIN code "V") is a Generation III small block V8 truck engine. Displacement is 4,806 cc (4.8 L; 293.3 cu in) with a bore and stroke of 96 mm × 83 mm (3.78 in × 3.27 in). It is the smallest of the Generation III Vortec truck engines and was the replacement for the 5.0 L 5000 L30. The LR4 engines in 1999 produced 255 hp (190 kW) while the 2000 and above models made 270–285 hp (201–213 kW) and all have a torque rating between 285–295 lb⋅ft (386–400 N⋅m), depending on the model year and application. The 2005-2006 models made 285 hp (213 kW) and 295 lb⋅ft (400 N⋅m), LR4s are manufactured at St. Catharines, Ontario and Romulus, Michigan. It uses flat top pistons. The Vortec 5300, or LM7/L59/LM4, is a V8 truck engine. It is a longer-stroked by 9 mm (0.35 in) version of the Vortec 4800 and replaced the L31. L59 denoted a flexible fuel version of the standard fuel LM7 engine. Displacement is 5,327 cc (5.3 L; 325.1 cu in) from a bore and stroke of 96 mm × 92 mm (3.78 in × 3.62 in). Vortec 5300s are built in St. Catharines, Ontario and Romulus, Michigan. Another engine variant, the L33, shares the same displacement, but has an aluminum block with cast in cylinder liners, much like the LS1. The Vortec 5300 LM7 (VIN code 8th digit "T") was introduced in 1999. It has a cast iron block and aluminum heads, and can be considered the "garden variety" version of the Generation III V8s. The 1999 LM7 engine produced 270 bhp (201 kW) and 315 lb⋅ft (427 N⋅m) of torque. The 2000-2003 engines made 285 bhp (213 kW) and 325 lb⋅ft (441 N⋅m). The 2004-2007 engines made 295 bhp (220 kW) and 335 lb⋅ft (454 N⋅m) of torque. The Vortec 5300 L59 (VIN code "Z") is a flexible fuel version of the LM7. The 2002-2003 made 285 hp (213 kW) and 320 lb⋅ft (434 N⋅m), while the 2004-2007 L59s made 295 hp (220 kW) and 335 lb⋅ft (454 N⋅m). The Vortec 5300 LM4 (VIN code "P") is an aluminum block version of the LM7, and had a short production life. The LM4s made 290 hp (216 kW) and 325 lb⋅ft (441 N⋅m), It should not be confused with the L33 described below. The Vortec 5300 L33 (VIN code "B") is an aluminum block version of the LM7, and was referred to as the Vortec 5300 HO in marketing materials. However it should be noted that the L33 uses a flat top piston from the 4.8L instead of the standard dish piston found in the LM7. It also uses 799 cylinder heads, which are identical to the 243 casting found on the LS6 and LS2 with the exception to the Corvette spec valve springs, and hollow stem exhaust valves on the 2002-2004 LS6. This combination increased the compression from 9.5:1 to 10.0:1. The L33 also had a specific camshaft not shared with any other engine, The cam specs @ .050 duration are: 193 duration, .482 lift, 116 LSA. As a result, power increased by 15 hp (11 kW), to 310 hp (230 kW) and 335 lb·ft (441 N·m). It was only available on extended cab 4WD pickup trucks. Only 25% of trucks made in 2005 had the L33 engine. The 6.0 L is a larger version of the LS motor. 6.0 L blocks were cast of iron, designed to bridge the gap between the new small blocks and big blocks in truck applications. There were two versions of this engine: LQ4, and LQ9, the latter being more performance oriented. The Vortec 6000 is a V8 truck engine. Displacement is 5,967 cc (6.0 L; 364.1 cu in) from a bore and stroke of 101.6 mm × 92 mm (4.00 in × 3.62 in). It is an iron/aluminum (1999 & 2000 model year engines had cast iron heads) design and produces 300 to 345 hp (224 to 257 kW) and 360 to 380 lb⋅ft (488 to 515 N⋅m). The Vortec 6000 LQ4, is a V8 truck engine. Displacement is 5,967 cc (6.0 L; 364.1 cu in) from a bore and stroke of 101.6 mm × 92 mm (4.00 in × 3.62 in). It is an iron/aluminum (1999 & 2000 model year engines had cast iron heads) design and produces 335 to 370 hp (250 to 276 kW) and 360 to 370 lb⋅ft (488 to 502 N⋅m). LQ4s are built in Romulus, Michigan and Silao, Mexico. The Vortec HO 6000 or VortecMAX is a special high-output version of the Vortec 6000 V8 truck engine originally designed for Cadillac. This engine was renamed as the VortecMAX for 2006. It features high-compression (10:1) flat-top pistons for an extra 10 hp (7 kW) and 10 lb⋅ft (14 N⋅m), bringing output to 345 hp (257 kW) and 380 lb⋅ft (515 N⋅m). LQ9s are built only in Romulus, Michigan. In 2005, the Generation III was superseded by the Generation IV. This category of engines has provisions for high-displacement ranges up to 7,441 cc (7.4 L; 454.1 cu in) and power output to 776 bhp (579 kW). Based on the Generation III design, Generation IV was designed with displacement on demand in mind, a technology that allows every other cylinder in the firing order to be deactivated. It can also accommodate variable valve timing. A 3 valves per cylinder design was originally slated for the LS7, which would have been a first for a GM pushrod engine; but the idea was shelved owing to design complexities and when the same two-valve configuration as the other Generation III and IV engines proved to be sufficient to meet the goals for the LS7. The Generation IV 6000 is a V8 engine that displaces 5,967 cc (6.0 L; 364.1 cu in) from bore and stroke of 101.6 mm × 92 mm (4.00 in × 3.62 in). It features either a cast iron or aluminum engine block with cast aluminum heads. Certain versions feature variable cam phasing, Active Fuel Management, and Flex-fuel capability. LS2 can also refer to the 1985 Oldsmobile Diesel V6 engine. The LS2 was introduced as the Corvette's new base engine for the 2005 model year. 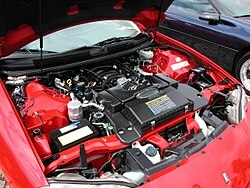 It also appeared as the standard powerplant for the 2005–2006 GTO. It produces 400 bhp (298 kW) at 6000 rpm and 400 lb⋅ft (542 N⋅m) at 4400 rpm from a slightly larger displacement of 5,967 cc (6.0 L; 364.1 cu in). It is similar to the high-performance LS6, but with improved torque throughout the rpm range. The LS2 uses the "243" casting heads used on the LS6 (although without the sodium-filled valves), a smaller camshaft, and an additional 18 cubic inches (290 cc). The compression of the LS2 was also raised to 10.9:1 compared to the LS1s' 10.25:1 and the LS6s' 10.5:1. The LS2 in the E-series HSVs are modified in Australia to produce 412 bhp (307 kW) and 412 lb⋅ft (559 N⋅m) of torque. The LS2 in the Chevrolet Trailblazer SS and the Saab 9-7X Aero are rated at 395 bhp (295 kW) (2006–2007) or 390 bhp (291 kW) (2008–2009) and 400 lb⋅ft (542 N⋅m) of torque due to a different (sometimes referred to as a "truck") intake manifold that produces more torque at lower RPMs. The LS2 is also used as the basis of the NASCAR Specification Engine that is used as an optional engine in NASCAR's Camping World Series East and West divisions starting in 2006, and starting in 2010 may also be used on tracks shorter than two kilometers (1.25 miles) in the Camping World Truck Series. A version of NASCAR V8 cylinder block cast in Compacted Graphite Iron by Grainger & Worrall won the UK's Casting of the Year Award 2010. The L76 is derived from the LS2, and like the LS2 it features an aluminum engine block. However, the L76 does feature Active fuel management (AFM). While the displacement on demand technology was disabled on Holdens, this feature is enabled on the 2008 Pontiac G8 GT and subsequently refitted in the 2009 model Holdens with AFM enabled, but only on models fitted with the 6L80 Automatic Transmission. The engine also meets Euro III emissions requirements. Output is 348 bhp (260 kW) at 5600 rpm and 376 lb⋅ft (510 N⋅m) at 4400 rpm for the Holden variant, and 361 bhp (269 kW) and 385 lb⋅ft (522 N⋅m) for the G8 GT. The Vortec 6000 or new VortecMax version is based on the Holden L76 engine, and features variable cam phasing, along with Active Fuel Management. It can be considered the replacement for the Generation III LQ9 engine. It produces 367 hp (274 kW) at 5400 rpm and 375 lb⋅ft (508 N⋅m) at 4400 rpm. Production of the truck-spec L76 started in late 2006, and it was only available with the new body style Silverado and Sierra. The final year for the truck-spec L76 was 2009 in the Silverado and Sierra; it was replaced by the 6.2L L9H engine for MY 2010. 2006 Holden VZ Commodore - Those built from February 2006 until July 2006 until the release of the VE series. 2006 Holden WL Statesman/Caprice - Those built from February 2006 until September 2006 until the release of the WM series. The L98 is a slightly modified version of the L76. Since Holden did not use the displacement on demand technology of the L76, some redundant hardware was removed to form the L98. Power increased to 270 kW (362 bhp) at 5700 rpm and 530 N⋅m (391 lb⋅ft) at 4400 rpm. L77 can also refer to the 455 Oldsmobile large crank journal engine. L77 engines were released in the Holden Commodore Series II VE range in both manual and automatic transmissions, along with the Chevrolet Caprice police car. The L77 differs from the L76 with its inclusion of Flex-fuel capability, allowing it to run on E85 ethanol. The L77 is rated at 270 kW (362 hp) and 530 N⋅m (391 lb⋅ft) of torque in the manual Commodore SS and SS-V, in automatic Commodores it is rated at 260 kW (349 hp) and 517 N⋅m (381 lb⋅ft) of torque. The LY6 is a Generation IV small block V8 truck engine with a cast iron block. It shares the same bore and stroke as its LQ4 predecessor. Like other Gen IV engines, it features variable valve timing. It generated 361 hp (269 kW) at 5,600 rpm and 385 lb⋅ft (522 N⋅m) of torque at 4,400 rpm using "regular" gas, or ~87 octane. Redline is 6,000 rpm and compression ratio is 9.6:1. This engine uses L92 / LS3 style rectangle port cylinder heads, though without the sodium-filled exhaust valves of the LS3. The L96 is essentially identical to its predecessor, the LY6. The primary difference is that the L96 is Flex Fuel capable, while the LY6 is not. 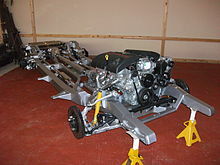 The LFA is a Generation IV small block V8 truck engine. The LFA variant is used in the GM's "two mode" hybrid GMT900 trucks and SUVs, and is an all-aluminum design. It has a 10.8:1 compression ratio and produces 332 hp (248 kW) at 5100 rpm and 367 lb⋅ft (498 N⋅m) at 4100 rpm. Engine VIN code of 5. In 2008 this engine was selected by Wards as one of the 10 best engines in any regular production vehicle. The LZ1 is almost entirely based on its predecessor, the LFA, but with some revisions, such as including up-integrated electronic throttle control, long-life spark plugs, GM's Oil Life System, Active Fuel Management and variable valve timing. It has the same compression ratio, power and torque ratings as its predecessor, the LFA. This family of blocks is just an updated version of its Generation III predecessor with Generation IV updates and capabilities. Applications of this family were mainly for trucks but did see some mild usage (with some modifications) in front-wheel-drive cars. The Vortec 4800 LY2 (VIN code "C") is a Generation IV small block V8 truck engine. Like its LR4 predecessor, it gets its displacement from a bore and stroke of 96 mm × 83 mm (3.78 in × 3.27 in). The smallest member of the Generation IV engine family, it is unique in that it is the only member of that family that is used in trucks that does not feature variable valve timing.It has a cast iron block. Power output is 260–295 hp (194–220 kW) and torque is 295–305 lb⋅ft (400–414 N⋅m). The Vortec 4800 L20 makes more power and features variable valve timing. The system adjusts both intake and exhaust timing, but does not come with Active Fuel Management. The L20 has a cast iron block and power output is 260–302 hp (194–225 kW) while torque is 295–305 lb⋅ft (400–414 N⋅m). The Vortec 4800 base engines were dropped from the Chevrolet Tahoe and GMC Yukon in favor of the 5300 with Active Fuel Management. The Generation IV 5.3L engines share all the improvements and refinements found in other Generation IV engines. 8 versions of the Gen IV 5.3L engine were produced: 3 iron blocks (LY5, LMG, and LMF) and 5 aluminum blocks (LH6, LH8, LH9, LC9, and LS4). All versions featured Active Fuel Management except for the LH8, LH9 and LMF. Introduced in 2010, the LMF is a lower tech version used in the lower volume half ton vehicles cargo vans with AWD that still used the 4 speed automatic, and do not use Active Fuel Management. The Vortec 5300 LH6 (VIN code "M") with Active Fuel Management replaced the LM4 for 2005, and was the first of the Generation IV small block V8 truck engines to go into production. The LH6 produced 300 to 315 hp (224 to 235 kW) and 330 to 338 lb⋅ft (447 to 458 N⋅m). It is the aluminum block counterpart to the LY5. The Vortec 5300 LMG (VIN code "0") is the flexible-fuel version of the LY5. Power and torque ratings for SUV and pickup truck applications are the same as each application's LY5 rating. Variable valve timing was added for the 2010 model year. The Vortec 5300 LC9 (VIN code "3" or "7") is the aluminum block Flex-Fuel version of the LH6, and is found in 4WD models. SUV applications are rated at 320 hp (239 kW) at 5400 rpm and 335 lb⋅ft (454 N⋅m) at 4000 rpm of torque. Pickup truck applications are rated at 315 hp (235 kW) at 5300 rpm and 335 lb⋅ft (454 N⋅m) at 4000 rpm of torque. Variable valve timing was added for the 2010 model year. The Vortec 5300 LH8 is a variant of the 5.3 L Gen IV small block V8 modified to fit in the engine bay of the GMT 345 SUV and GMT 355 trucks. It produces 300 hp (224 kW) at 5200 rpm and 320 lb⋅ft (434 N⋅m) at 4000 rpm. It has a displacement of 5,327 cc (5.3 L; 325.1 cu in). The Vortec 5300 LH9 is a variant of the 5.3 L Gen IV small block V8 modified to fit in the engine bay of the GMT 355 trucks. It has Variable Valve Timing (VVT) and produces 300 hp (224 kW) at 5200 rpm and 320 lb⋅ft (434 N⋅m) at 4000 rpm. It has a displacement of 5,327 cc (5.3 L; 325.1 cu in). The LS4 is a 5,327 cc (5.3 L; 325.1 cu in) version of the Generation IV block. Though it has the same displacement as the Vortec 5300 LY5, it features an aluminum block instead of iron, and it uses the same cylinder head casting as the Generation III LS6 engine. The bellhousing bolt pattern differs from the rear-wheel drive blocks. This engine is adapted for transverse front-wheel drive applications. According to GM, "The crankshaft is shortened 13–3 mm (0.51–0.12 in) at the flywheel end and 10 mm (0.39 in) at the accessory drive end – to reduce the length of the engine compared to the 6.0 L. All accessories are driven by a single serpentine belt to save space. The water pump is mounted remotely with an elongated pump manifold that connects it to the coolant passages. Revised oil pan baffles, or windage trays, are incorporated into the LS4 to ensure that the oil sump stays loaded during high-g cornering." Active Fuel Management is also used. Output of this version is 303 hp (226 kW)/300 hp on LaCrosse Super and 323 lb⋅ft (438 N⋅m). Inspired by the LS1.R in size and performance goals, this family of blocks was designed for race oriented performance. The only engine with this bore size that was used in a production vehicle is the LS7 with the LSX being only for aftermarket use. One unique feature of this family is that the cylinders are siamesed, no water passages between neighboring cylinders. This was done to increase both bore size and block strength. The LS7 is a 7,011 cc (7.0 L; 427.8 cu in) engine, based on the Gen IV architecture. The block is changed, with sleeved cylinders in an aluminum block with a larger bore 4.125 in (104.8 mm) and longer stroke 4 in (101.6 mm) than the LS2. The small-block's 4.4 in (110 mm) bore spacing is retained, requiring pressed-in cylinder liners. The crankshaft and main bearing caps are forged steel for durability, the connecting rods are forged titanium, and the pistons are hypereutectic. The two-valve arrangement is retained, though the titanium intake valves by Del West have grown to 2.2 in (56 mm) and sodium-filled exhaust valves are up to 1.61 in (41 mm). Peak output is 505 bhp (512 PS; 377 kW) at 6300 rpm and 470 lb⋅ft (637 N⋅m) at 4800 rpm of torque with a 7000 rpm redline. During GM's reliability testing of this engine in its prototype phase, the LS7 was remarked to have been repeatedly tested to be 8000 rpm capable, although power was not recorded at that rpm level, due to the constraints of the camshaft's hydraulic lifters and the intake manifold ability to flow required air at that engine speed. The LS7 is hand-built by the General Motors Performance Build Center in Wixom, Michigan. Most of these engines are installed in the Z06, some are also sold to individuals by GM as a crate engine. While it has the same displacement the Hennessey Venom GT utilizes an iron block LSX, not an LS7. After an extensive engineering process over several years, Holden Special Vehicles fitted the LS7 to a special edition model: the W427. The HSV-tuned engine produced 375 kW (510 PS; 503 bhp) at 6500 rpm and 640 N⋅m (472 lb⋅ft) at 5000 rpm of torque. It was unveiled at the Melbourne International Motor Show on February 29, 2008 and went on sale in August 2008. 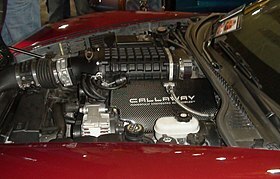 The first Australian car to be fitted with this engine, however, was the CSV GTS of 2007, which was claimed to have a power output of 400 kW (536 hp) and 600 N⋅m (443 lb⋅ft). This family was designed as a replacement for the LS2 but enlarged to better accommodate variable valve timing and Active Fuel Management while still generating good performance. This family of engines has mainly seen duty in performance cars and high-end SUVs. The 2007 Cadillac Escalade has a 6,162 cc (6.2 L; 376.0 cu in) Vortec 6200 (RPO L92) engine. It is an all-aluminum design which, while still a pushrod engine, boasts variable valve timing. The system adjusts both intake and exhaust timing between two settings. This engine produces 403 hp (301 kW) and 417 lb⋅ft (565 N⋅m) in the GMC Yukon Denali/XL Denali, GMC Sierra Denali, Hummer H2, and briefly in the Chevrolet Tahoe LTZ (midway through MY 2008 through MY 2009) and rated at 403 hp (301 kW) and 415 lb⋅ft (563 N⋅m). Starting in 2009, it was also available in the Chevrolet Silverado and GMC Sierra, as the L9H, with power ratings of 403 hp (301 kW) and 417 lb⋅ft (565 N⋅m). The 2009 L92 was modified with Flex Fuel capability, and became the L9H. In 2010, the L9H was further modified with Active Fuel Management, becoming the L94 (in the Cadillac Escalade and GMC Yukon Denali); interestingly, Active Fuel Management hardware was present in 2007 engines, but the software was not enabled in the PCM. The LS3 was introduced as the Corvette's new base engine for the 2008 model year. It produces 430 bhp (321 kW; 436 PS) at 5900 rpm and 424 lb⋅ft (575 N⋅m) at 4600 rpm without the optional Corvette exhaust and is SAE certified. The block is an updated version of the LS2 casting featuring a larger bore of 103.25 mm (4.065 in) creating a displacement of 6,162 cc (6.2 L; 376.0 cu in). It also features higher flowing cylinder heads sourced from the L92, a more aggressive camshaft with 0.551 in (14 mm) lift, a 10.7:1 compression ratio, a revised valvetrain with 0.236 in (6 mm) offset intake rocker arms, a high-flow intake manifold and 47 lb (21 kg)/hr fuel injectors from the LS7 engine. The L76/L92/LS3 cylinder heads use 2.165 in (55 mm) intake valves, and 1.59 in (40 mm) exhaust valves. Improved manufacturing efficiency makes these heads cheaper than the outgoing LS6 heads, and severely undercuts aftermarket heads. The large valves, however, limit maximum rpm - 6000 in the L76 (with AFM), and 6600 in the LS3 (with hollow stem valves). In addition to the above, a dual-mode exhaust package with a bypass on acceleration was available on C6 Corvettes. The dual-mode exhaust uses vacuum-actuated outlet valves, which control engine noise during low-load operation, but open for maximum performance during high-load operation. The system is similar to the C6 Z06, but uses a 2.5 in (64 mm) diameter exhaust compared to the Z06's 3 in (76.2 mm). Power is boosted to 436 hp (325 kW) and 428 lb⋅ft (580 N⋅m) with this option. A similar system was optional on later model 5th generation Chevrolet Camaros and standard on the 2016-2017 Chevrolet SS, but no horsepower or torque increases were advertised on those vehicles. From April 2008, Australian performance car manufacturer HSV adopted the LS3 as its standard V8 throughout the range, replacing the LS2. The LS3 received modifications for its application to HSV E Series models, producing 425 bhp (317 kW). The LS3 engine in the E Series II GTS (released September 2009) was upgraded to produce 436 bhp (325 kW). All HSV MY12.5 excluding the base Maloo and Clubsport variants have been upgraded to produce 436 bhp (325 kW). From September 2015 Holden introduced the LS3 in all V8 models of the VF II Commodore and WN II Caprice-V, replacing the 6.0L L77. The L99 is derived from the LS3 with reduced output but adds Active Fuel Management (formerly called Displacement on Demand) and variable valve timing, which allows it to run on only four cylinders during light load conditions. 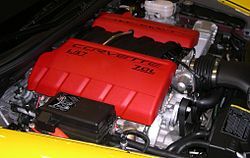 The Gen IV LS9 is a supercharged 6,162 cc (6.2 L; 376.0 cu in) engine, based on the LS3; the LS7 block was not used due to the higher cylinder pressures created by the supercharger requiring the thicker cylinder walls of the LS3. Cylinder dimensions are now bore and stroke of 103.25 mm × 92 mm (4.065 in × 3.622 in). It is equipped with an Eaton four-lobe Roots type supercharger and has a compression ratio of 9.1:1. Power output is rated 638 bhp (647 PS; 476 kW) at 6500 rpm and 604 lb⋅ft (819 N⋅m) at 3800 rpm of torque. Note: GM previously used the LS9 RPO code on 1969 and later Chevrolet trucks (both 2WD and 4WD) including Blazers, Jimmys, Suburbans, as well as car carriers. The original LS9 was a 350 cu in (5.7 L) V8, developing 160 hp (119 kW) and 245 lb⋅ft (332 N⋅m) of torque. The supercharged 6.2L LSA is similar to the LS9 and debuted in the 2009 CTS-V. The LSA has been SAE certified at 556 bhp (415 kW) at 6100 rpm and 551 lb⋅ft (747 N⋅m) at 3800 rpm. GM labeled it "the most powerful ever offered in Cadillac's nearly 106-year history". 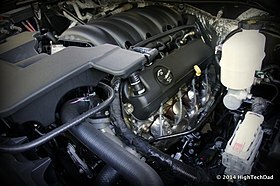 The LSA features a smaller 1.9 L (120 cu in) capacity supercharger rather than the 2.3 L (140 cu in) variant of the LS9. Other differences include a slightly lower 9.0:1 compression ratio, single unit heat exchanger and cast pistons. A 580 bhp (433 kW) and 556 lb⋅ft (754 N⋅m) version of the LSA engine is used in the 2012 Camaro ZL1. On May 15, 2013, Holden Special Vehicles announced that this version of the LSA engine will also be used in the GEN-F GTS. OHV 2 valves / cyl. 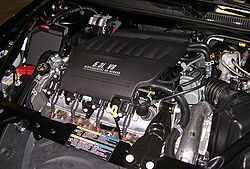 In 2007, wardsauto.com reported that the LS3 (used by 2008 Chevrolet Corvette) and Vortec 6000 LFA (used by 2008 Chevrolet Tahoe Hybrid) engines would be the final two designs in the Generation IV small-block engine family, and the future designs would be part of the Generation V engine family. An experimental engine was built based on L92 engine from Cadillac Escalade, GMC Yukon Denali and Hummer H2, and reported to generate 450 bhp (336 kW) on gasoline via direct fuel injection, increased compression ratio to 11.5:1, and a modified engine controller. 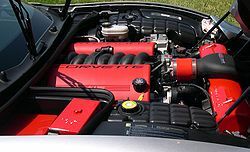 The first Gen V LT engine was the LT1, announced in 2012 as the initial powerplant for the redesigned Corvette C7, succeeding the LS engine family. The new logo formally adopts the Small Block name for the engines. The fifth generation of the iconic GM small block engine family features the same cam-in-block architecture and 4.4 in (110 mm) bore centers (the distance between the centers of each cylinder) that were born with the original small block in 1955. Structurally, the Gen-V small-block is similar to the Gen III/IV engines, including a deep-skirt cylinder block. Refinements and new or revised components are used throughout, including a revised cooling system and all-new cylinder heads. All Gen V engines are aluminum blocks with aluminum cylinder heads and include features such as direct injection, piston cooling jets, active fuel management, variable displacement oil pump, continuously variable valve timing. However, it does retain its ancestors' two-valve pushrod valvetrain. This family of blocks were the first of the generation V small block with the LT1 being the progenitor of this family and generation. This family of blocks has seen a wide range of applications from performance vehicles to truck usage. The 6.2 L; 376.0 cu in (6,162 cc) LT1 engine debuted in the 2014 Chevrolet Corvette Stingray and is the first Generation V small block engine. Like its LS3 predecessor, it gets its displacement from a bore and stroke of 103.25 mm × 92 mm (4.065 in × 3.622 in) with a compression ratio of 11.5 to 1. The 6.2 L; 376.0 cu in (6,162 cc) EcoTec3 is a Generation V small block V8 truck engine. (VIN Code "J") The L86 is an LT1 engine modified for truck use with a compression ratio of 11.5 to 1. The L8T is a 6.6 liter, iron block member of the Gen V family. It shares its 103.25 mm bore with the L86 but with a longer stroke of 98mm. It is rated for 401 horsepower at 5,200 RPM and 464 lb-ft of torque at 4,000 RPM. The compression ratio is 10.8:1. The longer stroke yields little additional torque output compared to the L86. The stroke is also shorter than the LS7's 101.6 mm, perhaps to optimize rod ratio for reliability. This suggests that the engine was de-tuned for reliability with displacement rising to compensate, rather than allowing a "highly strung" small block experience failure in the HD truck market. 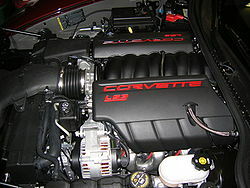 The 6.2 L; 376.0 cu in (6,162 cc) LT4 engine builds on the design strengths of the previous LS9 supercharged engine used in the sixth-generation Corvette ZR1 and leverages the technologies introduced on the seventh-generation Corvette Stingray, including direct injection, cylinder deactivation and continuously variable valve timing, to take Corvette performance to an all-new level. 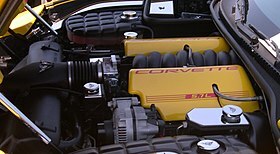 The LT4 engine is based on the same Gen 5 small block foundation as the Corvette Stingray's LT1 6.2 L naturally aspirated engine, incorporating several unique features designed to support its higher output and the greater cylinder pressures created by forced induction, including: Rotocast A356T6 aluminum cylinder heads that are stronger and handle heat better than conventional aluminum heads, lightweight titanium intake valves, forged powder metal steel connecting rods which are highly machined to an optimized geometry for increased strength while eliminating unnecessary reciprocating mass, 10.0:1 compression ratio, high for a forced-induction engine, enhances performance and efficiency and is enabled by direct injection, forged aluminum pistons with unique, stronger structure to ensure strength under high cylinder pressures, stainless steel exhaust manifolds for structure at higher temperatures, aluminum balancer for reduced mass, and standard dry-sump oiling system with a dual-pressure-control oil pump. The engine uses a 1.7 L (103.7 cu in) Eaton TVS Supercharger. Although smaller than the previous 2.3 L (140.4 cu in) supercharger used on the sixth-gen ZR1, it spins to 5000 RPM faster thus generating boost quicker while making only slightly less total boost than the LS9 engine. The 6.2 L; 376.0 cu in (6,162 cc) LT5 engine debuted in the seventh-generation Corvette ZR1 at the 2017 Dubai Motor Show. It draws its name from the 5.7L LT5 from the C4 manufactured from 1990-1995. The original LT5 is rarely known as a Chevy small block V8, as it was designed and built with Lotus, and implements a DOHC 32 Valve multi-port injection system, instead of the push-rod design. The new (and unrelated) LT5, however, has increased its displacement from 5.7 to 6.2 L, retains the Gen V OHV valvetrain, and is topped with a 2.6 L (158.7 cu in) Eaton TVS Supercharger and an improved intercooler. It simultaneously couples the standard direct injection system found on Gen 5 engines with port fuel injection. Power output is 755 bhp (765 PS; 563 kW) at 6400 rpm and 715 lb⋅ft (969 N⋅m) of torque at 3600 rpm. Unlike the previous Generation III/IV 3.78 in (96 mm) bore block families, there is no 4.8 L (290 cu in) displacement variant (having been 'replaced' by GM's 5th Generation LT V8-based V6, the 4.3 L (260 cu in) LV3). Dubbed EcoTec3 5.3 L (320 cu in) is a Generation V small block V8 truck engine. (VIN Code "C") Like its Vortec 5300 Generation IV predecessor, it gets its displacement from a bore and stroke of 96 mm × 92 mm (3.78 in × 3.62 in) with a compression ratio of 11.0 to 1. The L8B is an eAssist mild hybrid version of the L83 featuring a .45-KWH lithium ion battery pack. This setup can improve fuel efficiency by about 13%. This adds about 100 lb (45 kg) to the total weight of the truck but provides an additional 13 hp (10 kW) and 44 lb⋅ft (60 N⋅m). The L82 is one of two 5.3 liter V8s available in the 4th generation Chevrolet Silverado and GMC Sierra. The L82 is distinguished from the L84 by the absence of the Dynamic Fuel Management system, and is only available on lower trim trucks. The L84 is one of two 5.3 liter V8s available in the 4th generation Chevrolet Silverado and GMC Sierra. The L84 is distinguished from the L82 by the presence of the Dynamic Fuel Management System, and is either available or standard on mid- to high-level trims (save the GMC Sierra 1500 Denali, which is only available with the 6.2 liter V8). These V6 engines are based on the V8 version of the Gen V family, but with two fewer cylinders - a design lineage that dates back to the previous 4.3L V6, which was itself a Gen I small block with a pair of cylinders removed. Of special note, there were no V6 engines based on Generation II, III, or IV small block V8s. Dubbed EcoTec3 4.3 L (260 cu in) is a Generation V small block V6 truck engine. It gets its displacement from bore and stroke of 99.6 mm × 92 mm (3.921 in × 3.622 in) with a compression ratio of 11.0 to 1. Firing order is 1-6-5-4-3-2. This engine replaces the unrelated 4.3 L V6 whose lineage dates back to 1978. In the early production run of the LS-series engine, some engines encountered 'piston slap' during the first few minutes after a cold engine start; this sound is caused by the pistons rocking slightly in the cylinder until they reach operating temperature/size. 'Piston slap' sometimes sounds more like a knock or the sound of a diesel engine running. It is typically only present when the engine is cold and disappears as the engine reaches operating temperature. The noise of 'piston slap' often is louder when listening for it below the oil pan. Another common problem with the 2001-2006 5.3L engines was cracking cylinder heads. This is commonly called the 'Castech Head' failure on the internet. GM issued a TSB on this failure to help service techs identify the problem. The head casting (which can be viewed from the passenger side of the vehicle just in front of the valve cover) was 706. Some heads with this casting number would fail (but not all of them) as GM had different suppliers for the same head. The failure was due to undetected porosity around the oil drains in the head. In 2011, Chevrolet Performance began to offer the build your own engine program for LS7 (part number 19259944) or LS9 (part number 19259945) crate engines. It also provides customers the experience of visiting GM's unique Performance Build Center in Wixom, Michigan, where they will join a specially trained engine builder to assist in the start-to-finish assembly of the engine they purchased – from installing the crankshaft in the cylinder block to topping off the engine with its intake system. In the case of the LS9, it also means installing the supercharger assembly. Upon completion, a personalized nameplate is added to the engine. The build-your-own engine program associated with the V8 engines, available for buyers of Chevrolet Corvette, Cadillac XLR and certain top-spec Chevrolet Camaro models, were temporarily halted after the closure of GM Performance Build Center in Wixom, Michigan. The program's venue was reported to be relocated to the Corvette assembly plant in Bowling Green, Kentucky. The LS7.R engine is a variation of the LS7 used in the highly successful C6.R American Le Mans Series racecar. It was crowned as Global Motorsport Engine of the year by a jury of 50 race engine engineers on the Professional Motorsport World Expo 2006 in Cologne, Germany. LSx is also used to denote any LS engine. At the 2006 SEMA show, GM Performance Parts introduced the LSX engine, an all-new cast-iron racing block based on the LS7 engine. It was designed with help from drag racing legend Warren Johnson. It offers displacements ranging from 364 to 511 cu in (6.0 to 8.4 L) with a bore x stroke of 4 1⁄4 in × 4 1⁄2 in (108.0 mm × 114.3 mm) and is capable of withstanding 2,500 bhp (1,864 kW). This block incorporates two extra rows of head-bolt holes per bank for increased clamping capacity. The six bolt steel main caps are the same ones used on the LS7 engine. The engine debuted at the auto show in a customized 1969 Camaro owned by Reggie Jackson. The LSX will be available starting the second quarter of 2007, set to be available in authorized dealerships and retailers on March 31, 2007. Hennessey Venom GT uses LSX engine based on LS7. Chevrolet Performance LSX Bowtie block includes LSX specific six-bolts-per-cylinder head bolt pattern, billet-steel six-bolt dowel-located main bearing caps, extra-thick deck for maximum clamping force, extra-thick cylinder walls allow increased bore capacity (maximum 4.2 in (106.7 mm) bore still allows 0.2 in (5.1 mm) minimum wall thickness), true priority main oiling system, main web bay-to-bay breathing holes reduce crank windage, orange powder coat finish, machined bore at 3.88 in (98.6 mm) is ready for final boring/honing. A 396 cu in (6.5 L) version is used in NASCAR for the Gander Outdoors Truck Series and the ARCA Racing Series as an option engine. Chevrolet Performance LSX376 crate engines are updated versions of LSX crate engine family designed to support up to 1,000 hp (746 kW). All models use Chevrolet Performance LSX Bowtie block. LSX376-B15 (part number 19299306) includes forged steel crankshaft, forged powdered metal I-beam rods (both the crankshaft and rods from LSA engine) and forged aluminum pistons (9.0:1 compression), high-flow rectangular-port six-bolt LSX-LS3 heads for supercharged and turbocharged combinations producing up to 15 psi (1.0 bar) of boost and up to about 1,000 hp (746 kW). LSX376-B8 (part number 19171049) is a more economical version that is capable of approximately 8 psi (0.55 bar), for engine producing approximately 600 hp (447 kW). It is designed for production-style supercharger and turbo systems used without enhancements or modifications. ^ "LS1 Info and Specifications". Smokemup.com. Archived from the original on February 11, 2012. Retrieved January 25, 2012. ^ "LS Engines - Small Block Engine - Crate Engine". GM Performance Parts. March 24, 2011. Archived from the original on December 30, 2011. Retrieved January 25, 2012. ^ "NASCAR's new motor". Circletrack.com. Archived from the original on January 22, 2012. Retrieved January 25, 2012. ^ "Nascar block wins award - Grainger & Worrall". www.gwcast.com. Archived from the original on December 24, 2013. ^ "All-new G8 accelerates new era of rear-wheel-drive performance at Pontiac". Global Auto Index. February 7, 2007. Archived from the original on September 27, 2007. Retrieved August 30, 2007. ^ "2010 Vortec 6.0L V-8 VVT Hybrid (LZ1)". GM. 2010. Archived from the original on April 24, 2014. Retrieved May 21, 2013. ^ a b "GM Powertrain". GM. Archived from the original on July 2, 2013. Retrieved May 21, 2013. ^ a b "GM Inside News Forum - Engine Guide". Gminsidenews.com. March 22, 2009. Archived from the original on January 17, 2009. Retrieved April 26, 2009. ^ "Gen III & Gen IV Vortec Truck Engines". GM High-Tech Performance. February 26, 2007. Archived from the original on July 11, 2011. Retrieved September 21, 2010. ^ "2005 Chevrolet Corvette Z06, 2006 MY C6 US specifications". carfolio.com. Retrieved June 23, 2018. ^ "2008 HSV W427 specifications". carfolio.com. Retrieved June 23, 2018. ^ "Revealed: our fastest, most expensive road car". The Sydney Morning Herald. February 29, 2008. Archived from the original on April 20, 2008. ^ "CSV GTS LS7 - HSV's faithful wait for an official 7.0-litre project, but CSV has already beaten the factory to the power punch". Wheels. Motoring.com.au. December 2007. Archived from the original on June 20, 2015. Retrieved June 21, 2015. ^ Vertical Aviation Technologies (2013). "Hummingbird 300LS". Archived from the original on January 28, 2013. Retrieved February 14, 2013. ^ "2007 Chevrolet Corvette ZR1, 2009 MY C6 US". carfolio.com. Retrieved June 24, 2018. ^ Sutton, Mike (August 29, 2007). "GM Reveals Small-Block V-8 With Direct Injection". WardsAuto.com. Archived from the original on June 13, 2008. Retrieved August 30, 2007. ^ "GM 6.2 Liter Supercharged V8 Small Block LT4 Engine". GM Authority. Archived from the original on September 11, 2017. Retrieved September 8, 2017. ^ Mackenzie, Angus (January 13, 2014). "The torque's the thing: 625-hp Z06 Corvette debuts in Detroit". www.gizmag.com. Gizmag. Archived from the original on September 6, 2015. ^ Smirnov, Andre. "2017 GMC Sierra 1500 eAssist Hybrid: Is There Future in Hybrid Pickup Trucks? [Video] - The Fast Lane Truck". www.tfltruck.com. Archived from the original on April 6, 2017. Retrieved April 5, 2017. ^ "Chevrolet Introduces 2016 Silverado with eAssist". media.gm.com. Retrieved April 5, 2017. ^ "LS7: The Largest, Most Powerful Small-Block Ever Built". National Corvette Museum. Archived from the original on January 12, 2005. Retrieved January 10, 2005. ^ "New 6.6L V-8 GM Engine For 2020 Silverado, Sierra HD Assigned L8T RPO Code". GM Authority. Retrieved February 14, 2019. ^ "Castech Head Failure TSB" (PDF). Archived (PDF) from the original on March 27, 2012. Retrieved January 25, 2012. ^ "Build Your Own LS7 or LS9 Crate Engine". gm.com. ^ "GM relocating build-your-own engine program to Bowling Green". autoblog.com. Archived from the original on September 20, 2013. ^ Hellwig, Ed (October 2006). "2006 SEMA Show - Reggie Jackson Camaro". Edmunds Inside Line. Archived from the original on August 20, 2007. Retrieved August 30, 2007. ^ "Stronger LSX™ Bowtie Blocks are Foundations for Boost-Ready Chevrolet Performance LSX376 Crate Engines". gm.com. Wikimedia Commons has media related to General Motors LS engines.